Sempulam is a Tamil word meaning not just ‘red soil’, but is a portmanteau of semmal, the rich Tamil classical period and pulam which refers to our roots or to the region we come from. This is the name aptly given to an event on the indigenous breeds of livestock of the Tamil Nadu region that is to take place on January 6th and 7th in Chennai. About 62 percent of the soil in the Tamil Nadu region is of the red variety. The indigenous livestock here have adapted in such a manner to the soil and geography that they are integral to our original natural farming practices. These practices worked collaboratively with nature rather than against it, before the advent of the Green Revolution and chemical farming in India since the 1960s. 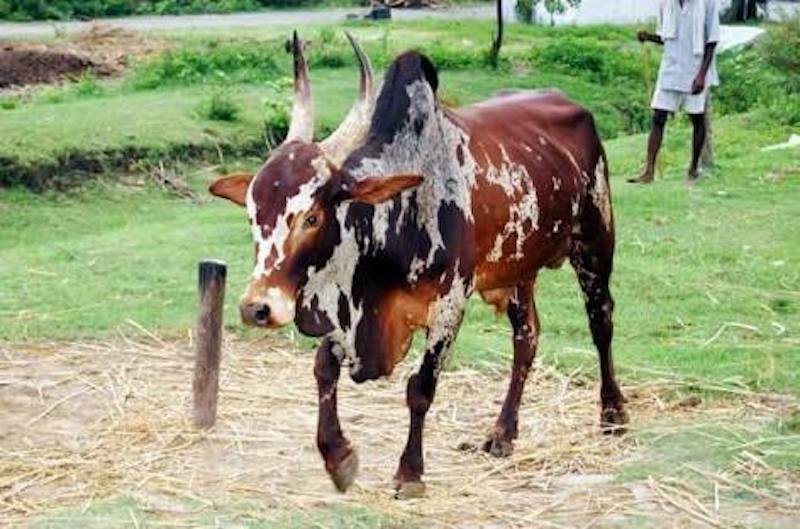 Sempulam advocates the need to preserve the native breeds of livestock in Tamil Nadu by bringing to light the collaborative relationship between sustainable agriculture and indigenous breeds. Himakiran, a social activist and member of Safe Food Alliance, an association of physicians, lawyers, traders, human rights activists, farmers, consumers and academicians with an objective to ensure safe food to all, grow food that rejuvenates our soil and environment and secures farmers' livelihoods, explains one such fascinating relationship between cattle, farming and the commons. "Tamil Nadu was once a region of man-made waterbodies called eris," he says. There are two kinds of eris - system eris and the non-system eris. System eris are fed by streams of rivers through a channel with the land’s natural contour, while the non-system ones are standalone tanks that are rain-fed. Tamil Nadu had many system eris. However, because of built area encroachments and levelling of land for construction, we have lost most of our natural land contours and system eris. Consequently, we have also become an extremely flood-prone ecosystem. Earlier, the eris would fill during the monsoons and remain as water catchments for irrigation well after the monsoons. Just before the onset of summer they would go dry and several wild grasses and plants would grow in their damp beds. These would then become grazing grounds for cattle. The cattle would graze on this wild plant diversity and deposit their dung and urine, making the eri bed soil rich and teeming with microbes. This soil, called vandal mann was used by farmers for their crops growing near the eri, and even today farmers practicing sustainable agriculture continue to do this along the remaining eris. In this manner, native breeds of cattle would get a diverse and seasonal natural diet; their bodies were hardy and suited for the geography they were from, and they made for excellent draught animals. This was an effective closed-loop system where there was no need to get any farming inputs from outside and all the waste within the ecosystem was converted in situ into wealth in the form of enriched soil. This system was cost effective too as they did not have to spend much on fodder for their cattle, that were also resilient and not prone to any major illnesses or diseases. Sempulam is organised by Dhenu Cattle Conservation Foundation (DCCF) and the South Indian Organic Producers & Retailers Association (SOPRA). DCCF is a trust engaged with the conservation of the ‘Pulikulam’ breed of cattle, well known for sallikattu also called jallikattu, a traditional livestock spectacle sport practiced since the Tamil Classical period, where a Bos indicus bull, like the Pulikulam or Kangayam breed was used. Read more about the importance of a regulated form of Jallikattu. DCCF also engages with farmers and pastoralists practicing natural farming, to help address the challenges they face today. The other organiser, the South Indian Organic Producers & Retailers Association (SOPRA), was formed to connect organic retailers, wholesalers, Farmer Producer Organizations (FPOs), and other organic establishments in the socio-environmental sector in South India to ensure that consumers get access to authentic organic products. Raja Marthandan, managing trustee of DCCF and founder of Shudh Farms, a native breed dairy farm integrated with sustainable agriculture in Thiruporur, explains that there are three broad categories of native cattle: draught breeds, dairy breeds and dual purpose breeds (both draught and dairy). The National Bureau of Animal Genetic Resources (NBAGR) is dedicated to work with its mandate of identification, evaluation, characterisation, conservation and utilisation of livestock and poultry genetic resources of our country. In Tamil Nadu, there are four main recognised breeds of cattle – Kangayam, Umblacherry, Pulikulam and Bargur. Marthandan illustrates the interesting connection between the characteristics of each of these breeds to the geography and soil of the region they are found in and how they are integral to sustainable farming practices. Kangayam are a large-sized breed found in western Tamil Nadu where it is generally arid. Therefore, the conditions there facilitated the development of their big-made bodies and they could easily pull heavy loads and plough dry lands. Umblacherry are a short but broad-hoofed variety found in the Tanjore district, which has clay soil and wetlands. These conditions make their short legs and broad hooves useful to walk and plough in slush. Pulikulam are a hardy and frugal breed from the Madurai-Sivagangai-Ramnad belt. Their physical characteristics lie between the Kangayam and Umblacherry breeds - they are short-legged but not as short as the Umblacherry. Interestingly, the soil in this region is a mix of clay and red soil. Bargur belongs to the Bargur forest hills of Erode district in Western Tamil Nadu, where the terrain is undulating and harsh. They are not fully domesticated and are semi-wild. Their unique feature is that when a cow gives birth to a calf, she hides the calf in a burrow in the forest, just like many wild animals do. Bargur do not require to be tied or housed in protective shelters. In this manner, environmental factors such as the weather, soil and geography as well as human factors such as dietary habits in the fodder they were given have contributed to the development of specific breeds. These region-specific breeds have particular features that are resilient to the adverse conditions of their region. The main premise of natural farming is collaboration and symbiotic relationships in any ecosystem. This symbiosis includes plant and animal biodiversity specific to a region, a non-exploitative relationship between humans and the rest of the ecosystem, and a culture and community that respects nature and this symbiotic relationship. Sempulam aims to showcase this key facet of natural farming, with a specific focus on the role of livestock. Other than cattle there will also be native breeds of roosters, hens, ducks, goats, dogs, and horses participating. The idea is to disseminate knowledge to everyone through talks by natural farming practitioners, soil ecologists, ethno-veterinary medicine practitioners, pastoralists, native breed conservationists and organic and traditional food enthusiasts. The event will help aspiring natural farmers find ways to integrate farming with native breeds of livestock in order to conserve them, especially since modern organic agriculture uses more machinery than livestock. Parthasarathy, who runs a social enterprise called Farmer & Co that works closely with farmers, farmer groups and women’s self-help groups to bring genuine organic produce to the market, explains how farm animals can still be integrated in modern sustainable agricultural practices. For example, native hens and roosters are useful on a farm as they scratch the soil, do biological pest control by eating some worms and insects, are hardy and less prone to diseases and produce excreta that enriches the soil. He says that they need to be looked at beyond just as egg-producing animals and more for their holistic contribution to a farm ecosystem. The event will also have performing arts like Poikal Kuthirai, a folk dance of Tamil Nadu with a dummy horse; Thappatam, a musical art form of Tamil Nadu with folk songs; Karagattam, an ancient folk dance of the region dedicated to the rain goddess, Mariamman; and Terukkuttu, Tamil street theatre. There will also be stalls with traditional games and organic food. To know more about the event, follow Sempulam on Facebook and Instagram. Maya Ganesh is a socio-environmental researcher, educator, writer, consultant and natural farming practitioner, with an interest in community-driven sustainable initiatives, closed loop systems, rural-urban linkages, children and the environment, and spiritual ecology. She can be reached on mayaganesh74 (at) gmail (dot) com.